“The Riddles of Wipers,” by John Ivelaw-Chapman, tells behind-the-scenes stories about the Wipers Times, the frontline journal published by an officer in the Sherwood Foresters battalion. (Wipers was the British name for the Belgian town of Ypres.) The Wipers Times was filled with sarcasm, inside jokes, which Ivelaw-Chapman dissects, fake advertisements and poetry sometimes, but not always comical. The original readers of the Wipers Times would have found it hilarious and probably passed cuttings around till they fell apart, by which time the soldiers would have had them memorized. The design of “The Riddles” can be confusing. Ivelaw-Chapman switches in and out of italic so that it can be hard to separate his comments from quotes. But the Wipers Times presents a unique look at life in the trenches and the resilience of the common soldier when it comes to making fun of the officers. 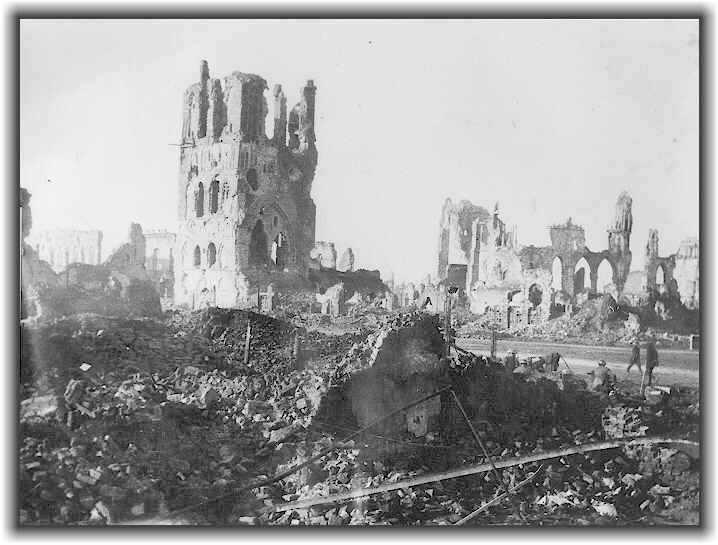 This is the Cloth Hall, a medieval landmark in Ypres reduced to rubble. This entry was posted in Books and tagged books, Ypres by World War One Historical Assn. Bookmark the permalink. Thanks for participating. We’ve linked to this review and will post a snippet on Feb. 17.